At La Mesa Beautiful, the spirit of our organization looks out for you and your gardens. We care about bees and butterflies that pollinate, succulents and cacti that flower and save us water, vegetables and fruits that sustain us, vines that provide fragrance, and a host of plants that fill our lives with a sense of well-being. In caring about our community, we provide scholarships for promising horticultural students at Cuyamaca College and El Capitan High School, donate trees to La Mesa schools, and have a plant sale the first weekend in May at St. Andrew’s in La Mesa where master gardeners are available. One of our most enjoyable events is our Spirit Awards. In March, we begin our goal to find single-family homes whose residents have created notable front yard landscapes. We pull out our phones and take pictures, we write down addresses, and we bring our happy finds back to the board and share them. We’d also love for the community to nominate landscapes. The winners receive a “Landscape Award” sign that can be placed in their yard. They are invited to attend our annual Spirit Award luncheon. In our little gardening corner here in La Mesa Courier, we’ll tell you what’s going on in La Mesa Beautiful like our Arbor Day presentations at Maryland Avenue on March 20 at 1 p.m. and at La Mesa Arts Academy on April 18 at 10:30 a.m.
“Remember, the best day to plant a tree was 20 years ago, and the second best day is today,” says our Master Gardener Susan Taylor. We’ll invite you to our annual meeting to hear speakers like last month’s guest, Marcia Van Loy, who taught us about “Attracting Pollinators to Your Garden.” We’ll give you tips and suggestions about seasonal planting. Let’s get started. March is the best time for getting out in your gardens and cleaning up those weeds (without chemicals). Feed your soil by adding mulch on top of the soil or forking in some compost. Your plants start their growing period in spring and could use some light liquid fertilizer with a 20/20/20 Ph. Don’t forget to water them before you feed them so the fertilizer won’t burn their roots. Since rain is not something we can count on anymore in this drought region, be sure your drip irrigation and/or sprinkler system is working properly. You may see some living insects like aphids, white flies, or spider mites. Check out the Pest Section in “Sunset Western Garden Book” for Climate Zone 24. It is tempting to kill them with vengeance using some horrible insecticide, but dish soap in water and a strong spray will do the trick. Your plants will be safe and your pests will be gone. 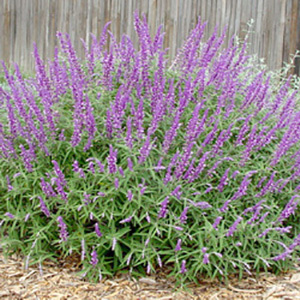 It’s time to give your Mexican Sage a trim. When you see about six inches of new growth at the base, cut the dried stems and spikes off. That beautiful lavender and purple flower will now grow full again. Time to plant other heat-loving perennials: lavender, penstemon, asters, African daisies to fill out your garden. In late March and early April when the ground starts to warm up and fear of frost has passed, start planting your favorite vegetables and herbs. 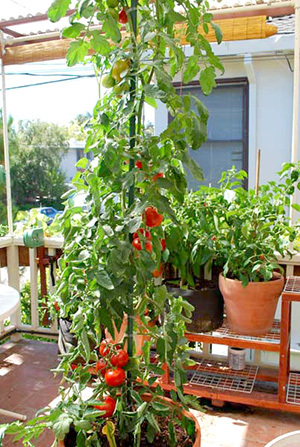 Spring planted tomatoes will produce fruit for two to three months in La Mesa. A second planting in June/July will give you tomatoes into fall. The plants will need staking to support the vines and keep the fruit off the ground. And by the way, removing “suckers” does not increase production and may allow the sun to scald the fruit. Beefsteak varieties do well in our hot summers. It’s also a good time to plant kale, radishes, peppers, and beans. And the entire time we’re writing and reading and sharing and gardening, we will take care of each other’s spirits. La Mesa Beautiful’s sole purpose is to celebrate you and your creative, flowing, fragrant, colorful, water-saving gardens. We’ll all learn from each other, so join us at events, become a member, or volunteer your time. Contact us at lamesabeautiful@gmail.com. Happy gardening! — Nancy Jordon is secretary and Sharon Fitzpatrick is vice president of La Mesa Beautiful.